Tsogo Sun values the media in understanding that they play an important role in communicating to the public and our guests on various aspects of our business. As a part of our external communication strategy, we fully engage our media and continue to feed current press releases from our Press Room to them as one form of engagement. We have a library of our press releases for your convenience. Tsogo Sun is fully contactable and available on request by the media. The HCI Supplier Club, created to provide support and benefits to qualifying small, medium and micro enterprises. Who are suppliers or potential suppliers to the diverse HCI Group and its subsidiaries, has launched its first directory featuring of a wide range of small businesses that supply HCI companies. The HCI Supplier Club, which has been operating since 2015, was created to strengthen the prospects for the small businesses who are members, and expose them to further opportunities for growth. It provides a range of benefits that include regular events where members can showcase their products and services to other HCI companies; supplier development events; newsletters and databases; discounts through various HCI companies, including Tsogo Sun hotels ; marketing opportunities; and more. The 2019 HCI Supplier Club Directory is being distributed to HCI subsidiaries and their key stakeholders, to Club members for their own publicity purposes, and it is being published online. As the popularity of gin continues to soar to unimagined heights around the world, delighting cocktail lovers with the vast array of options, Southern Sun Hyde Park’s elegant Luce Restaurant, in collaboration with Autograph Gin, has launched a gin tasting menu, featuring a partnership of exquisite flavours by Executive Chef Grant van der Riet and Autograph Gin’s Distiller, Matt Beech. Autograph Gin is a premium local craft gin, produced in Stellenbosch, with an exceptional taste that is derived from blended botanicals and fynbos selected by master distillers. The botanicals are grown on-site and handpicked by the distilling team, to create a distinct fusion of tastes and scents. In 2018, at the Michelangelo International Wine and Spirits Awards in Cape Town, Autograph Gin was awarded the Top Scoring Craft Gin of 2018 and received the Distillique Craft Gin Trophy. The gin tasting menu includes two starters paired with Gin Daiquiri – Autograph Gin, fresh lime juice, and lime zest; two main courses paired with The Alchemist – Autograph Gin, cayenne pepper, and apricot jam; and two desserts paired with The Medicine Man – Autograph Gin, honey, fresh lime juice, and muddled apple. The cost of the full menu is R800 per person and is available for dinner, seven days a week. Starters are a seafood sensation, consisting of Salmon rose with salmon roe and mini tuna hand roll, and Pan-fried and crispy calamari served with fried zucchini with mushrooms in sea salt, aioli and chilli sauce. 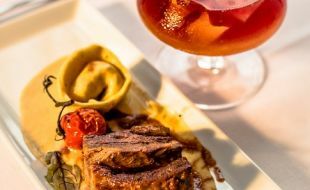 The two main courses are Beef short rib braised in tomato on a white bean & thyme paste served with pumpkin & ricotta tortellini, burnt butter and sage, and Home-made pumpkin & ricotta Tortellini served on pumpkin puree, burnt butter, sage and fresh black truffle. Desserts offer both sweet and savoury delights to complement the gin, in the form of Chocolate & hazelnut torta with baby apple and deconstructed torrone, and Smoked Gorgonzola cheese served with home-made fig preserve, fresh bread, honeycomb and strawberries. Southern Sun Hyde Park offers a selection of diverse menus, an excellent wine selection, and a pool deck that was recently voted as Joburg’s Best Sundowner Spot. For bookings of the Autograph Gin Tasting Menu, please contact Luce on +27 11 341 8080. Tsogo Sun has a portfolio of over 100 hotels and 13 casino and entertainment destinations throughout South Africa, Africa and the Seychelles. In KwaZulu-Natal, the elegant Beverly Hills is inviting loving couples to follow their hearts and enjoy a night of indulgence and romance with an overnight special on 14 February that includes bubbly and strawberries on arrival, dinner in the Sugar Club with the theme, ‘a Night in Paris’, a sea-facing bedroom, and a lavish breakfast with more bubbly, for R5,895 per couple. Or a French-inspired dinner only with a glass of bubbly in the Sugar Club on 14 February for R1,200 per person. Or an evening on the Pool Lawns overlooking the Indian Ocean, under the stars, watching a movie, with a picnic hamper and a bottle of bubbly – for R695 per person. Southern Sun Elangeni & Maharani has a line-up of specials on 14 February with something to suit every couple that include three-course menus at Vigour & Verve and Grill Jichana, a buffet at Lingela Restaurant, and a magical night of dinner and dancing at the spectacular Sky venue on the 31st floor. Other Tsogo Sun venues offering a night of romance in KZN include Drakensberg Sun, Garden Court Ulundi and Garden Court uMhlanga. In Cape Town, Southern Sun The Cullinan will be serving a decadent buffet dinner, while Southern Sun Waterfront’s decadent five-course set menu is sure to steal her heart. On the West Coast, Mykonos is starting the day the romantic way with a Valentine’s Day breakfast offer at Black Pearl Restaurant and The Caledon’s Date Night package is the perfect midweek getaway to the spectacular Overberg. In Mpumalanga, Southern Sun Emnotweni’s buffet dinner at Jasmine Restaurant includes a 350ml bottle of Amarula per couple at R220 per person, and Sabi River Sun Resort’s weekend package is valid from 15 to 16 February and includes accommodation, sundowner picnic at the river with a bottle of bubbly and canapés, buffet dinner at Sesonke Restaurant, and 20% discount on a couples massage, at R2,690 per package. Tsogo Sun’s Valentine’s Day specials extend further, with red hot Valentine’s promotions at Goldfields Casino in Welkom and Garden Court East London, and even beyond South Africa’s borders to Dar es Salaam, Maputo, Nairobi, Tete, Lusaka and Abu Dhabi. Thirteen Tsogo Sun hotels and resorts (https://www.tsogosun.com/hotels) have won 19 TripAdvisor Travellers Choice Awards this year in various categories, as voted by world travellers on criteria that include remarkable quality, service and value. 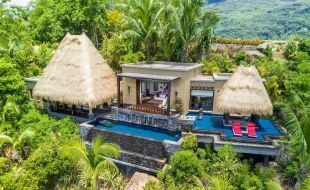 MAIA Luxury Resort & Spa in the Seychelles won in the Top 25 Hotels in Africa category; Cabana Beach Resort, Beverly Hills Hotel, Beacon Island Resort, 54 on Bath, and the Palazzo all won in the Top 25 Hotels in South Africa category. 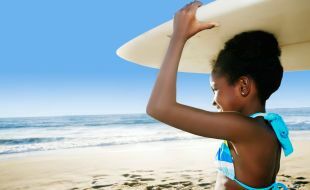 Five properties won in the Top 25 Hotels for Families in Africa category – Cabana Beach, uMhlanga Sands, Sabi River Sun, and Drakensberg Sun resorts, and Gold Reef City Theme Park Hotel; six Tsogo Sun properties dominated the Top 10 Hotels for Families in South Africa category – Cabana Beach, uMhlanga Sands, Sabi River Sun, Drakensberg Sun, and Riverside Sun resorts, and Gold Reef City Theme Park Hotel; Southern Sun Ikoyi won in the Top 10 Hotels for Service in Nigeria; and Southern Sun Abu Dhabi won in the Top 25 Bargain Hotels in UAE. The Travellers Choice Award winners are based on millions of reviews and opinions collected in a single year from TripAdvisor travellers worldwide. The awards have been running annually since 2002. Some of Jozi’s most superbly-located sundowner spots can be found nestled within Tsogo Sun properties. Each one uniquely distinct and offering the perfect location for celebrations, romance, meetings and special occasions. Island Bar at Southern Sun Hyde Park offers guests the opportunity to unwind and sample cocktails in the splendour of an unforgettable Highveld sunset. A carefully curated menu featuring light snacks and indulgent beverages await, with service excellence to match. Breath-taking panoramic views and a truly sophisticated setting in the heart of Hyde Park have made this the Best Sundowner Spot as voted by the public in the Best of Joburg Awards. The Friday Sundowner gets the weekend started with a line-up of top South African DJs each Friday from 16h30. A relaxed and refined atmosphere awaits those who visit 54 on Bath’s tranquil Perrier Jouet Champagne Garden. Situated in the leafy suburb of Rosebank, this luxury Johannesburg hotel offers a signature blend of luxury, style, and intuitive service that extends to its Champagne Bar and Garden. Perfectly positioned below a pool deck that almost spans the length of the property itself, 54 on Bath Champagne Garden’s enchanted ambience is unmatched. 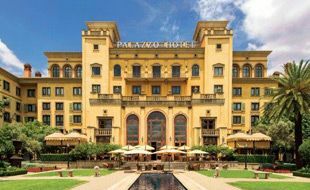 Inspired by the design of the 15th century Palazzo Corsini villa in Italy, Southern Sun Montecasino is the perfect blend of style and old-world Venetian charm. An elegant lounge area gives way to a one-of-a-kind deck overlooking an infinity pool and a waterscape inhabited by a family of swans. The last Friday of the month is popular for Sundowners on the Deck, with live entertainment and a menu that features meze platters, pizza slices and sliders paired with a bespoke cocktail menu, including a distinctive selection of rum creations. 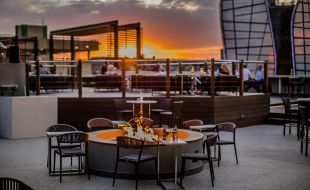 Sandton Sun’s rooftop restaurant – San Deck – has cemented its status as one of the top sundowner spots in the country with an extensive refurbishment and refreshed menu, created by Chef Gerard Vingerling. Set against the backdrop of the Sandton skyline and featuring social hubs, fire pits and seating designed for relaxation, this uniquely African meeting spot vibrates with the energy of the precinct and its people. The music complements the contemporary and energetic heart of South Africa’s business hub, and, come sunset, resident DJs deliver a pulsating Afrocentric beat. The beverage menu is a true showcase of the quality of South African spirit, beer, wine, MCC and cider producers. Tsogo Sun has a portfolio of over 100 hotels and 13 casino and entertainment destinations throughout South Africa, Africa and Seychelles. For more details, visit https://www.tsogosun.com, follow on Twitter @TsogoSun or like on Facebook/TsogoSun. 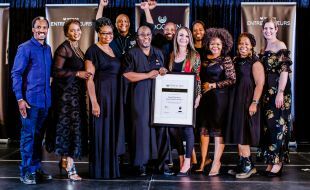 Tsogo Sun has won a plethora of awards – as a group and for four properties within the group – positioning it once again among the best in the world, the best in Africa, and the best in South Africa in a range of categories. Tsogo Sun and Sandton Convention Centre took three coveted awards at the Business Traveller Awards Africa 2018 – with Tsogo Sun winning the Best South African Hotel Group and the Best Business Hotel Group in South Africa categories and Sandton Convention Centre winning the Best Large Conference Venue award. Star Readers’ Choice voted Sandton Convention Centre as the winner in the category "Best Conference Venue Centre in Gauteng” during 2018, a certificate which allows winners to use the accolade for 12 months as part of their advertising campaigns. On an international scale, two Tsogo Sun hotels won top honours at the 2018 World Luxury Hotel Awards, which provides luxury hotels with global recognition for their world-class facilities and service excellence. 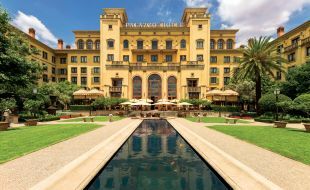 For the seventh consecutive year, the Palazzo hotel at Montecasino won a Luxury Casino Hotel award in the Africa category, and InterContinental Johannesburg O.R. Tambo moved up the charts with a global Luxury Airport Hotel award, having won in the Africa category last year. Closer to home, the annual Best of Joburg Readers’ Choice Awards 2018 celebrated the best of the best, and named Southern Sun Hyde Park – popular among Joburg’s trendy crowd – as 2018’s Best Sundowner Spot. The hotel offers breathtaking views from the rooftop deck, exhilarating Friday DJ sessions, and a fresh and innovative Island Bar menu and curated cocktail selection. 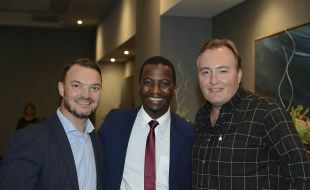 The ceremony, which was held at The Pivot at Montecasino with Rams Mabote, celebrity speaker, radio personality and entrepreneur as MC, commemorated 100 years since the birth of Nelson Mandela, and marked the dawn of a new chapter in the Tsogo Sun Entrepreneurs programme. Vive le Champagne! It’s time to titillate your taste buds with the bubbly sparkle and glorious taste of Champagne in a not-to-be-missed celebration of Champagne Day 2018 with Tsogo Sun. On #ChampagneDay – Friday 19 October – and right through the weekend to Sunday 21 October, Champagne will flow from morning till late at select Tsogo Sun hotels where guests can enjoy their golden, white or pink bubbles in the ambience of one of Tsogo Sun’s beautiful venues in Johannesburg, Cape Town and Durban – from the decks of Southern Sun Montecasino or Southern Sun Hyde Park and the spectacular views from the Beverly Hills, Southern Sun Elangeni & Maharani and 14 Stories at SunSquare Cape Town City Bowl, to the stunning settings of the Palazzo at Montecasino, 54 on Bath, the Stella Bar at Southern Sun The Cullinan, and others. 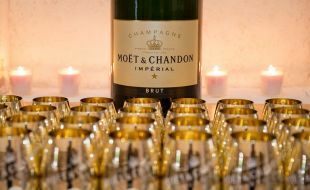 Tsogo Sun, which has earned a reputation as home to a wide selection of renowned Champagnes at the best wine list prices all year round, will be featuring four champagnes and one MCC (Méthode Cap Classique) on #ChampagneDay: Moet & Chandon Nectar at R595; Moet & Chandon Brut Imperial at R495; Veuve Clicquot Rosé at R735; and Veuve Clicquot Yellow Label at R545. The MCC is Graham Beck Bliss Demi Sec or Graham Beck Brut for R250 at a fantastic buy-one-bottle-get-one-free special offer. Gather friends, family and other Champagne lovers from Friday 19th until Sunday 21st October and join the celebrations at a Tsogo Sun venue. Then share your Tsogo Sun #ChampagneDay experiences on social media using @TsogoSun #ChampagneDay #MUSTBEMOET. After all, #ChampagneDay is for sharing! 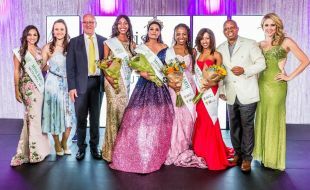 The Miss Earth South Africa 2018/2019 Leadership Programme winner’s announcement gala dinner was hosted at the Tsogo Sun, Montecasino Ballroom on 06 October 2018. Finalists from across the country gathered to share their work, projects and to engage in a round table discussion on the state of the environment from the perspective of each of their respective fields of study and passion. The dialogue and evening were facilitated and hosted by South African acclaimed TV and Radio Broadcaster and media entrepreneur, Zizo Tshwete. 21 year old Nazia Wadee of Lenasia in the South of Johannesburg, was announced as the 2018/2019 winner. She holds an undergraduate degree from Wits University in International Relations and Media Studies and is currently an Honours student. She will continue to add value to the already established #WasteStopswithMe campaign. Nazia is followed by three runner ups who will work together with her in the year ahead as they continue to drive environmental education, awareness and community programmes. These young women include; 1st Runner Up, Mpumelelo Maduna from Rockville in Soweto who is currently doing her BTech in Marketing Management; 2nd Runner up is Pinky Mokwena from Attridgeville in Tshwane an she holds a BTech Degree in Environmental Sciences followed by the 3rd Runner up Charlotte Joja who is completing her Honours in BA Psychology from the University of Johannesburg. 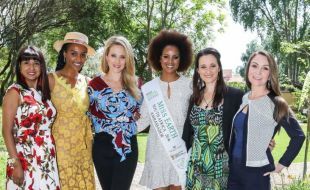 Saturday night was not only a celebration of another year of environmental advocacy, community service and greening the nation, but the Miss Earth South Africa Leadership Programme also celebrated a milestone. 2018 marks the organisations 15 years of activism and service in communities across South Africa. In attendance at this year’s event were Minister of Tourism Derek Hanekom, Executive Mayor Herman Mashaba, Gauteng MEC of Education Panyaza Lesufi, Ambassadors and Government dignitaries. UNEP Regional Manager Cecilia Njenga was in attendance showing her full support of the programme alongside, City of Johannesburg Health MMC Dr Mpho Phalatse. 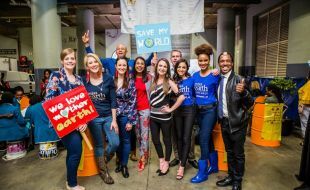 Environmental activist group and educational campaign; the Miss Earth South Africa Leadership Programme hosted a farewell for their South African delegate for the 2018 international Miss Earth event to take place in Manila, Philippines on the 3rd of November. 26-year-old Bloemfontein born, Margo Fargo has been selected to represent the organization and the country at the international competition. Margo graduated with her Honours in BSC Consumer Sciences in Sustainability at the University of the Free State. Margo took part in the Miss Earth South Africa leadership programme in 2014 and has been an incredible ambassador, for the Free State and for the programme over the past five years. women who share a journey with us each year” stated Constantinides. greening projects, food security with a special focus on climate-justice. All of these will be highlighted and shared by Margo as she embarks on a four-week trip across the Philippines. and constantly pursuing an impactful change in beauty and in leadership. Her story has always been unique, special and impressionable. Margo has made it her mission to make a difference as a young woman from the developing community of Heidedal, Bloemfontein. She has taken part in the Miss Free State, Miss Mamelodi Sundown’s and the Miss SA. Margo had the following to say; “Having grown up in a developing community, with difficult circumstances, my life is a true testimony of what one can achieve with the correct mindset and always challenging yourself to become a better version of yourself. This passion is fuelled by being an example to those who face similar obstacles. Education, a heart for leadership and sustainable change is my driving force in everything I do. I believe that circumstance is not a defining element but a gateway to moving on to a better lifestyle. This gorgeous and vibrant young woman, will be competing in a National Costume, deigned and made by, award winning; Sonwabile Ndamase, of Vukani Fashions. “Mr Ndamase sews and creates the Miss Earth South Africa National Costume with a golden thread. This has seen us win gold in this category for five consecutive years,” said Constantinides. Margo’s evening wear has been designed by internationally acclaimed South African Couture designer, Casper Bosman, showcasing strongly individual driven looks in a collection that is dominated by bold, powerful design and luxuriant fabrics. There is no doubt Margo will be the shining star of the night as she graces the international stage in his designs. For her swimwear collection Margo will be competing in original South African, Shweshwekini swimwear. We are also very excited to have Margo wear adidas Parlay running shoes. In 2015, adidas announced a partnership with Parley for the Oceans, an organisation that raises awareness about the beauty and fragility of the oceans. Our young ambassador travels in style with her Samsonite luggage and her couture garments. Having planted trees to counteract Margo’s travel schedule, this young woman is ready to take centre stage. Follow her journey on the official @missearth_sa on Instagram and Twitter and via Facebook at Miss Earth South Africa. Everyone remembers the teachers in their lives who inspired, encouraged, instilled values, and taught them well – their impact is often a strong boost along a learner’s life journey. In celebration of World Teachers’ Day on 5 October, Tsogo Sun pays homage to the major influence that educators have on ensuring the success of the group’s extensive CSI education initiatives over the past seven years. World Teachers’ Day this year marks the 70th anniversary of the Declaration of Human Rights that recognises education as a fundamental right, while acknowledging that there are an estimated 264 million children and youth out of school globally, and to reach the 2030 Education Goals of universal primary and secondary education, the world needs to recruit about 69 million new teachers. Tsogo Sun’s major CSI education initiatives include career guidance and preparation for high school learners, providing guidance and support for subject choices and career direction; a chess programme for foundation phase learners that is designed to connect aspects of the game with maths, science, and lifeskills concepts; and leadership training for high school learners that encourages them to be self-motivated, work-ready and employable. Other CSI initiatives within the group where educators play a significant role include the Olwazini Discovery Science Centre, which is Golden Horse Casino’s on-site science and computer centre that attracts hundreds of learners annually; support by Suncoast Casino of the Vukukhanye Educare ECD Centre for vulnerable children in the Chesterville community in Cato Manor, KZN; support by Hemingways Casino of the ITEC Maths, Science and Technology programme that contributes to improved competence in the subjects among learners and teachers in the Eastern Cape; and more. Renowned as one of South Africa’s top tourism destinations, Durban has long delivered excellence for both holiday and business travel, with golden beaches, a year-round warm climate, a wide range of entertainment options and conference facilities, a diverse and vibrant culture, and world-class accommodation. In honour of Tourism month and Heritage Day in September, Tsogo Sun is commemorating its growing investment in the city’s tourism offering over the last five decades. Tsogo Sun currently boasts seven hotels and two resorts from uMhlanga in the north to uShaka Marine World in the south, as well as the area’s leading entertainment destination, Suncoast. The group’s nine properties together offer 1 958 rooms, 13 restaurants, eight bars, and a myriad of other facilities and amenities. For decades, when South Africans think of holidays, Durban is the top of mind city – and Tsogo Sun’s hotels have continued to tick all the boxes for ideal accommodation, the best ocean views, the finest restaurants, and the easiest access to the city’s beautiful beaches. Tsogo Sun’s Durban heritage began with the opening of the Beverly Hills in uMhlanga by Sol Kerzner in 1964. From this, Southern Sun was born in 1969, and in 1971 the group’s first new hotel was built, The Elangeni, on the Durban beachfront, which was followed by the iconic five-star Maharani. In 1981 Umhlanga Sands Hotel was bought and the Southern Sun Timeshare concept was launched, which subsequently included Cabana Beach Resort. Garden Court Marine Parade opened in 1985 with a distinctively art deco feel, and then Garden Court South Beach, previously Malibu Hotel, joined the family. In 2002 the group invested a further R1.4 billion into the Golden Mile – the single largest investment by any private company – with Suncoast Casino, Hotels & Entertainment, adding two hotels (Suncoast Towers and SunSquare Suncoast) and an array of entertainment, retail, gaming, fast-food and restaurant options. The ninth hotel, Garden Court uMhlanga, opened in 2010, and in 2013, Tsogo Sun transformed two of its beachfront hotels into the massive 734-room Southern Sun Elangeni & Maharani hotel. It’s spring break – the season for refreshing and rejuvenation, for getaways that prepare us and our kids for the final often demanding stretch before year end… not to mention being an ideal opportunity for making memorable experiences for the whole family. That’s the thinking behind Tsogo Sun’s Spring Break discounts of 25% in the warm and welcoming city of Durban. The 25% discount offer is valid from 23 September to 10 October in six Tsogo Sun hotels (https://www.tsogosun.com/hotels) from Umhlanga in the north to Suncoast in the south, at Beverly Hills, Southern Sun Elangeni & Maharani, SunSquare Suncoast, Garden Court Marine Parade, Garden Court South Beach, and Garden Court Umhlanga, for a minimum stay of two nights. The special rates include breakfast for two adults, and with the exception of Beverly Hills, include free accommodation and breakfast for two children under the age of 18 sharing with adults. 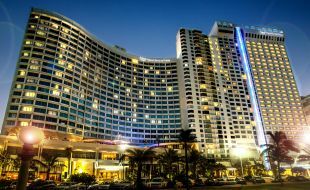 To book your Tsogo Sun Durban Spring Break, visit www.tsogosun.com/offers/durban-spring-break or call Reservations on 011 461 9744. Tsogo Sun and Montecasino, in partnership with Miss Earth South Africa, hosted a Waste Dialogue at the Montecasino Recycling Depot on Thursday, 13 September during Clean-up and Recycle SA Week, to discuss the serious issues presented by unmanaged waste, the vital importance of recycling and the critical roles citizens can play in reducing our impact on the environment. This year’s annual Clean-up & Recycle SA Week will culminate in the first ever global World Clean-up Day on Saturday, 15 September 2018. In support of Montecasino’s efforts to reduce the quantity of waste generated, tenants of the entertainment destination signed a pledge recommitting to the principles of the #WasteStopsWithME campaign. Montecasino has a progressive tenant agreement that covers the environmental management system in detail and requires co-operation in areas such as waste management and minimisation, energy and water management, and awareness and training of staff and customers. Ongoing environmentally responsible initiatives with Montecasino’s tenants include ‘The Last Straw’ campaign, where tenants are encouraged to eliminate the use of plastic straws due to the lasting damage they do to the environment, particularly the oceans, and to replace plastic cups with biodegradable cups. The #WasteStopsWithME Dialogue on 13 September was moderated by Generation Earth’s founder, Ella Bella Constantinides Leite, and included panel discussions about waste statistics in South Africa, how the waste industry functions, and business challenges and opportunities. It included participation by Tsogo Sun and Miss Earth South Africa, packaging companies, waste management organisations, the Department of Environmental Affairs, and the UN Environmental Programme. 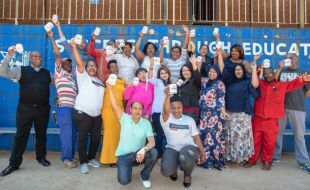 The event was held at the Montecasino Waste Depot to highlight the property’s steadily growing recycling efforts, which are currently at about 40% of waste, with aims to up the levels to 45% by year end. The dialogue brought together Plastics SA, the Paper Recycling Association of SA, SAPPI, Tetra Pak, Nampak, MetPac SA, UN Development Programme, the Department of Environmental Affairs, and the City of Joburg. Montecasino’s waste is managed by Interwaste at the on-site depot, where waste is sorted and separated, compacted, and transported to different depots for recycling, and to landfills. As a community service, Montecasino also has public recycling facilities adjacent to the Pivot that are available to customers and staff, for glass, cardboard and paper, tins, and e-waste such as batteries or globes, which all feed into Montecasino’s waste stream, and which local residents are encouraged to use to increase levels of recycling. Earlier this year Montecasino installed a Joraform Bio-container, imported from Sweden, in the staff dining room, where over 1 500 meals are produced daily, to create compost from food waste in two-week cycles. An additional machine will be installed by December 2018 to turn further food waste on the property into compost for use in Montecasino’s extensive gardens and at the Bird Gardens. 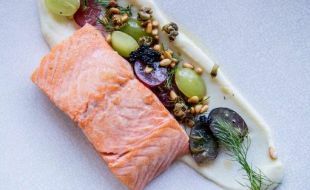 The spectacularly-located Lucé in Hyde Park has launched an exciting new menu, crafted by Chef Gareth Jordaan. Formerly executive sous chef at The Palazzo Montecasino, Jordaan has injected his own brand of culinary flair into the Lucé menu, creating traditional Italian dishes in keeping with the restaurant’s theme, but “with a twist”. Jordaan is a wholehearted believer that diners taste with their eyes, incorporating what he terms “funky plating techniques” into his repertoire. Starters have a distinct wow factor and main courses are hearty and flavourful. Having reduced the size of the menu, Jordaan’s dishes display enormous attention to detail and a focus on achieving consistency and high standards. A choice of eight starters, 16 main courses and six desserts offer a balanced selection of dishes that accommodate a range of dietary requirements and all showcase Jordaan’s philosophy of simplicity and quality. “If you eat at Lucé, you eat good food,” he says. For bookings, contact Lucé on +2711 341-8080. Tsogo Sun’s portfolio includes over 90 hotels and 14 casino and entertainment destinations throughout South Africa, Africa, the Seychelles and Abu Dhabi. For further information, visit tsogosun.com, follow on Twitter and Instagram @TsogoSun or like on Facebook/TsogoSun. The exciting urban and resort casino portfolio includes the most popular entertainment destinations, strategically located throughout South Africa. In the Gauteng province, Tsogo Sun owns the group’s flagship property, Montecasino in Fourways, which features, amongst other attractions, the award-winning Teatro; Gold Reef City Casino and Theme Park in Southern Johannesburg; and Silverstar Casino to the West in Krugersdorp. Additional properties are owned and operated in the Western Cape, Eastern Cape, Free State, Mpumalanga and KwaZulu-Natal, including the jewel on Durban’s Golden Mile, Suncoast Casino, Hotels and Entertainment. Tsogo Sun Citizenship is the group’s corporate citizenship strategy which encompasses three areas of focus. This includes Corporate Social Investment, whereby the group promotes the development of learners through three academies which offer holistic, full-year programmes centred around sport, art and education; Entrepreneur Development which focuses on skills-based entrepreneurial development through its Tsogo Sun Book a Guesthouse and Supplier Development programmes; and Environmental Education, committed to initiatives that reduce the impact the business has on the environment. For more information go to tsogosun.com, follow us on Twitter @TsogoSun or like us on Facebook.